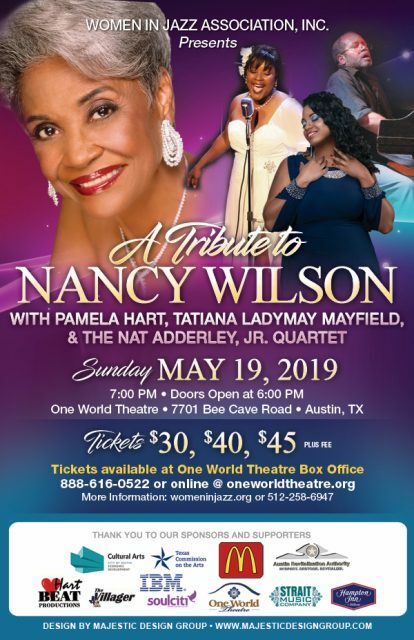 A Tribute to Miss Nancy Wilson – Women In Jazz Association, Inc.
Pamela Hart, Tatiana “LadyMay” Mayfield and Nat Adderley, Jr. pay tribute to Miss Nancy Wilson giving reverence to her cool and sweet style as a singer and storyteller. Known as a singer’s singer, Pamela and Tatiana will step into big shoes and present a stunning concert of Miss Nancy Wilson favorites. Who could better accompany these great vocalists but Nat Adderley, Jr., whose uncle catapulted Miss Nancy Wilson’s career with the album Nancy Wilson and Cannonball Adderley? What Pamela, Tatiana and Nat have in common is that they all loved the music of Miss Nancy Wilson from a young age. In this show you will see the passion in the singing and the music as Women in Jazz Association, Inc. honors the American icon, Miss Nancy Wilson. Information: For more information, call 512-258-6947. 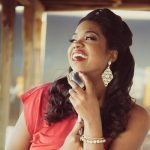 Refreshing and beautiful are how many have described the voice and persona of Tatiana ‘LadyMay’ Mayfield, a jazz vocalist, musician, and educator from Fort Worth, Texas. ‘LadyMay’ (as she has been named) has been singing and playing jazz music since the tender age of thirteen. 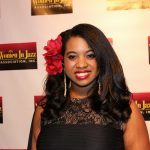 An international performer, she has opened for several well-known artists such as Will Downing, Kirk Whalum, and more. 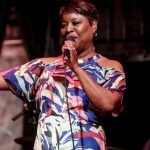 On her CD A Portrait Of LadyMay Harvey Siders, former writer of Jazz Times Magazine, describes her intonation as ‘flawless’ and her scatting ‘as natural as breathing.’ She has performed in various venues and festivals throughout the U.S., received rave reviews from listeners, and numerous awards. She has recorded three albums, From All Directions (2009), A Portrait Of LadyMay (2012) and The Next Chapter (2018). The first album From All Directions was recorded while she was still attending the University of North Texas, where she received her degree in Jazz Studies. Jazz journalist Scott Yanow described her voice on her debut album From All Directions (2009) as ‘attractive’ with ‘excellent elocution’ and a ‘joyful spirit.’ On A Portrait Of LadyMay Harvey Siders, former writer of JazzTimes Magazine, describes her intonation as ‘flawless’ and her scatting ‘as natural as breathing.’ In addition to her vocal skills, she plays piano, trombone, composes, and teaches voice. Nat Adderley Jr. is best known for his work with Luther Vandross. Nat wrote (and arranged) Luther’s first top 20 pop hit, ‘Stop to Love,’ and some other important Luther songs, including ‘Wait for Love’ and the Grammy-nominated ‘Give me the Reason’. Nat also arranged many of Luther’s most popular records, including ‘Superstar,’ ‘Here and Now,’ ‘If Only for One Night,’ ‘Creepin,’ ‘If This World Were Mine,’ ‘So Amazing,’ ‘There’s Nothing Better Than Love,’ ‘Never Too Much,’ and ‘Love Won’t Let Me Wait’. Additionally, Nat produced tracks on the last seven Vandross studio albums. These include ‘My Favorite Things,’ ‘Have Yourself a Merry Little Christmas,’ ‘Going Out of My Head,’ ‘Knocks Me Off My Fee,’ and ‘The Closer I Get To You,’ a duet with Beyoncé Knowles. Nat was Luther’s musical director from 1981 until his death. Many other artists have had major successes with help from Nat Adderley, Jr. Nat wrote ‘The Wave’ for Kirk Whalum, arranged Natalie Cole’s 1987 hit recording of ‘When I Fall In Love,’ produced ‘Just Another Lonely Night’ for Johnny Gill, arranged most of Aretha Franklin’s album Jump To It, produced Gloria Lynne’s album No Detour Ahead, and did the string arrangement for Doc Powell’s Grammy-nominated version of ‘What’s Going On.’ Also, Nat produced tracks for the Temptations’ CD ‘Awesome’ (2001), and Ruben Studdard’s ‘Love Is’ (2009). Sponsors: City of Austin Cultural Arts Division; McDonald’s; IBM; Soulciti.com; HartBeat Productions, LLC; Austin Revitalization Authority; Strait Music Company; The Villager Newspaper; Hampton Inn by Hilton. Contributions from private donors. Thank you for helping Women in Jazz make this happen!